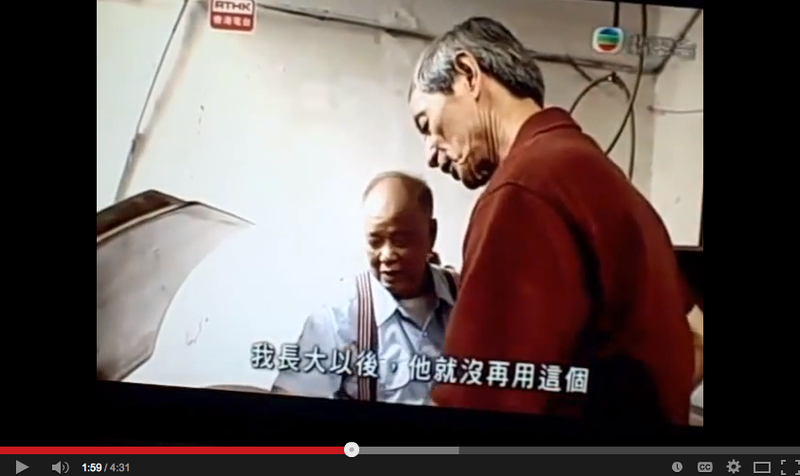 Excerpt from 2012 RTHK (Hong Kong) documentary on Chinese laundries. After showing some media examples depicting extremely hostile attitudes toward Chinese laundrymen, I make a visit to the Sam Sing laundry in West Los Angeles, one of the few remaining full service Chinese laundries still remaining to interview retired owner Jon Wong. Sam Sing Laundry was also featured in a CBC (Canadian) radio documentary on Chinese laundries in 2011. Around the end of the 19th century, graphic images of physical violence toward Chinese were common. Using laundrymen to represent all Chinese, there were numerous newspaper and magazine drawings depicting physical attacks on them. I describe and show several of these images and read a short children’s song mocking the laundryman. Such images both reflected and generated such harmful acts. A 2012 RTHK documentary used computer animation to dramatically illustrate these actions against laundrymen. The end of this excerpt of the hour long documentary on Chinese laundries and restaurants shows a visit to the Sam Sing Laundry where retired owner Jon Wong talks about the operation of this business in Los Angeles started by his father a generation earlier and now continued into a third generation by his son Albert. I met producer Yvonne Gall of Canadian Broadcasting Company (CBC) Radio when I spoke in Vancouver at a fundraiser for Foo’s Ho Ho Restaurant in 2010. She was intrigued by the descriptions I included of what it was like to grow up in a Chinese laundry, which led her to decide to make a documentary about the experiences of children in Chinese laundries. In 2011 Yvonne came from Vancouver to interview me at my home in southern California. Afterwards, I took her to visit to one of the few remaining Chinese laundries in the area, the Sam Sing Laundry. 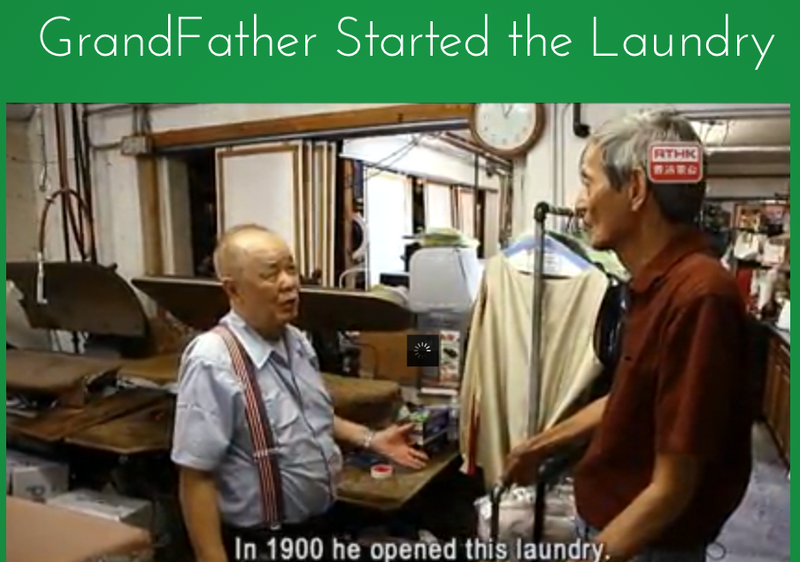 Present owner Albert Wong, a third generation descendant of the original owner, showed us the interior of the laundry. 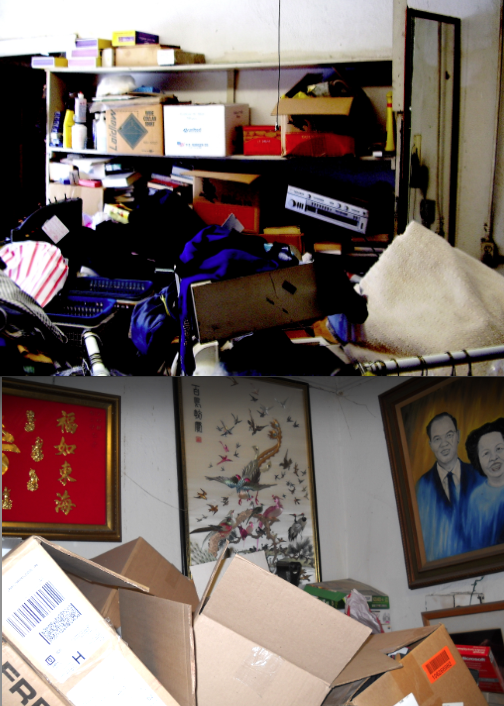 The interior space of Sam Sing Laundry, as the photographs below attest, is cluttered and cramped from wall to wall, a condition that was fairly typical of Chinese laundries. Laundrymen, like other Chinese immigrants, were frugal and pragmatic as they struggled to survive. Nothing was discarded if it might possibly be eventually useful. Albert also spoke briefly about the history of Sam Sing Laundry, which is included in the hour long CBC audio documentary, Chinese Laundry Kids. 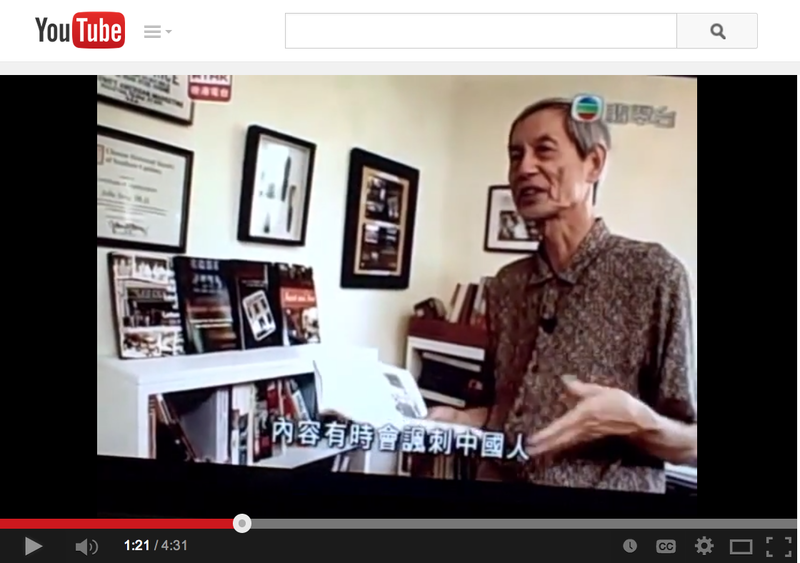 In 2012, RTHK Hong Kong Television made a 5-hour documentary on Chinese in North America. I served as a consultant for producer Annie Yau who created episode 4, which dealt with Chinese laundries and restaurants. 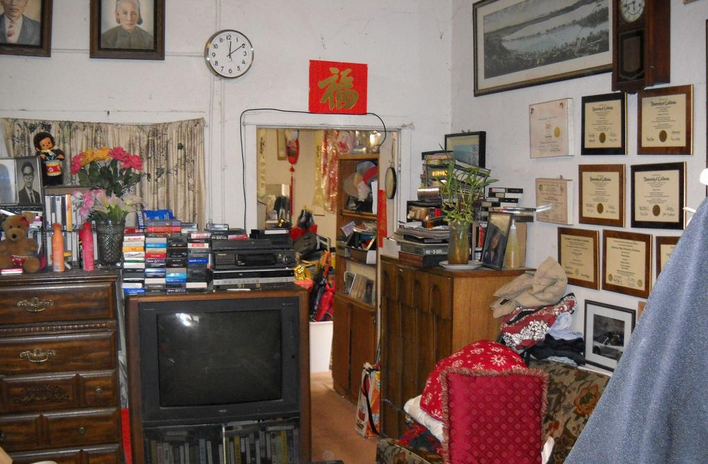 The Sam Sing Laundry again proved to be a valuable resource as it is a living “museum” or laboratory for examining the work and living space that Chinese laundries served for hundreds of Chinese immigrants over many decades. I took Annie and her film crew to the Sam Sing Laundry where they filmed my conversation with Albert Wong’s father, Jon Wong, who operated the Sam Sing Laundry for many decades. He spoke about the history of this business that was started by his grandfather in 1900, which is a small part of the hour-long 2012 RTHK video documentary. The building that housed the Sam Sing Laundry, as was true for many other Chinese laundries, was also where owners and their families lived in other sections of the building. Not only did this arrangement reduce expenses, but it also enabled owners to guard the premises against theft, vandalism, and fire. Living in the laundry also provided safety from physical assaults Chinese might encounter if they had to travel from the laundry after they closed to reach their residences. 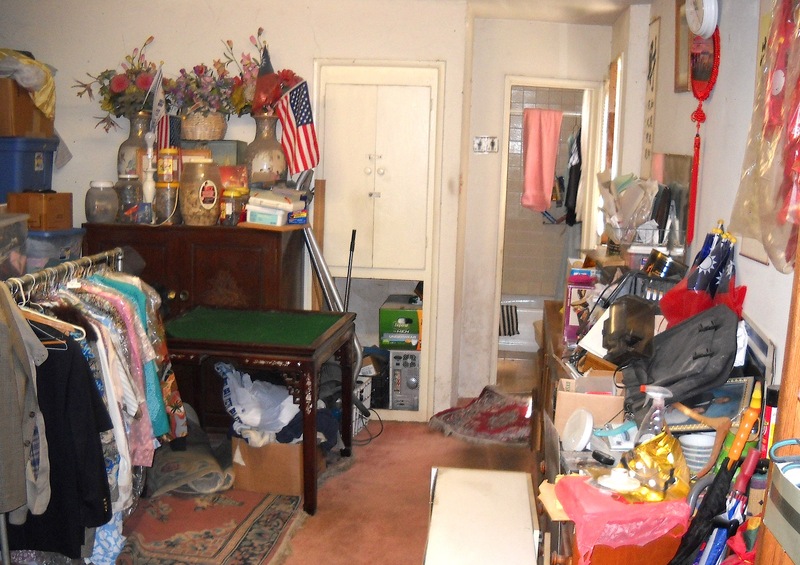 The photographs of the living quarters of the Sam Sing Laundry in the linked collection below show the kitchen and eating areas as well as the family room. The walls are lined with family photographs including grandparents and parents in China as well as children and grandchildren. Framed diplomas of the academic achievements of the descendants are proudly displayed.